In 2010, there were 23 new posts, growing the total archive of this blog to 50 posts. There were 77 pictures uploaded, taking up a total of 105mb. That’s about a picture per week. The busiest day of the year was October 13th with 89 views. 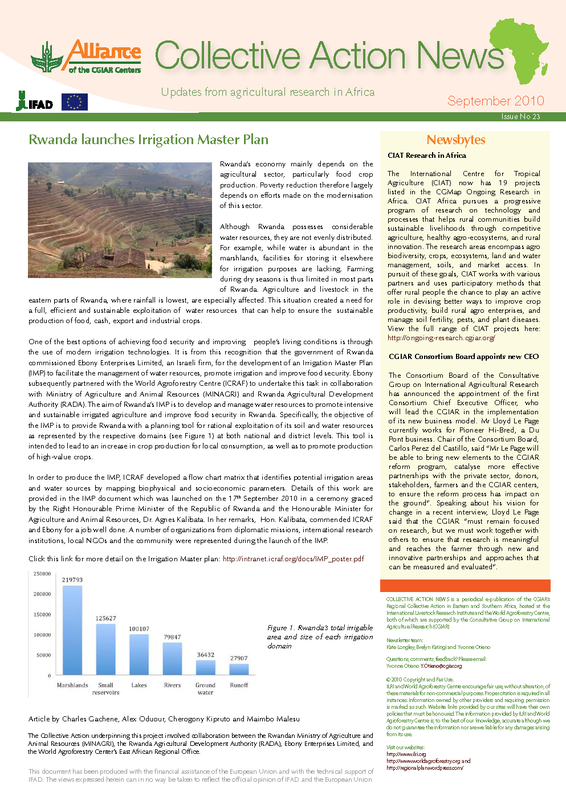 The most popular post that day was Rwanda launches Irrigation Master Plan – September Collective Action News. The top referring sites in 2010 were ilri.org, ilrinet.ilri.cgiar.org, ictkm.cgiar.org, twitter.com, and farastaff.blogspot.com. Some visitors came searching, mostly for ravi prabhu, agriculture in east africa, collective action, copenhagen climate change agriculture, and cgiar reform. Having been in the industry of PR I have realized a lot of things that one needs to know in case you want to be a PR practitioner, because this is a field concerned with maintaining public image for high-profile people, organizations, or programs. Public Relations (PR) concerns professions working in public message shaping for the functions of communication, community relations, crisis management, customer relations, employee relations, government affairs, industry relations, investor relations, media relations, mediation, publicity, speech-writing, and visitor relations and finally graphics design. They say internship is an extended interview process that will affect your future in the job market. The professionals you come in contact with during your internship may be a good reference after graduation. This is especially important, as an increasing number of employers require on-the-job experience for potential hires. The one month that I have been attached under collective action has really done me wonders, one of the duties I was to perform during my internship was to design collective action advert materials for meetings and event, the most recent project assignment was to design several advert materials for the project which were to be displayed at ILRI’s Annual Planning Meeting (APM) meeting which was help in in Ethiopia, last month. I decided to start with the poster, came up with a creative work plan which provided me with a framework for planning the work, and it was a guide during the period that I was working on the poster. In my mind I had a lot to cover so I had to look for a good headline and a sub head as well which would capture the reader’s attention, and as they say pictures are worth a thousand words, I had to look for a perfect picture that would represent the whole idea. Deciding on the content however, given that I had limited space, I had to decide between what was important and what was not necessary. My decision was based on at least some factors, namely; what was I trying to achieve by presenting the posters? Is it to sell the product? Is it to tell people what i have done? Is it to tell people of a new discovery? Is it to convince people that one product or technique is better than another? Who will be attending the presentation? Are they technical people? What is the level of their knowledge of my subject area? The answers to these questions defined the type of content to include and set the tone of presentation. CGMAP Ongoing Research in Africa gives one the access of hundreds of projects carried out by the CGIAR centers in the world we had to look for complete reasons why one should visit the map, what is in the map and where to find specific information on the projects that are in the map all this had to be done with a standard format. A good poster is readable, legible, well-organized and succinct. Before I begun shuffling charts, text and photos, I asked myself one question; If the viewer only carries away one idea, what do I want it to be? Posters tell stories. Your poster tells viewers what you did, why you did it and what you found out from doing it. My idea was to keep the poster simple and visually uncluttered, in that someone standing three feet away could quickly understand what each component was and why it was there and the poster columns would be easier for the eye to follow than information laid out left to right. The background materials and graphics would have straight edges and even margins. I started a rough draft process crucial in deciding whether one needs to cut/add text or resize figures or fonts, decisions that entailed many hours of fussing and gnashing of teeth. After the draft i sent my supervisor a copy, to comment on mistakes done, she had to look at the word count, prose style, idea flow, figure clarity, font size, spelling, etc. she printed the poster on a letter-sized paper and we spent a couple of minutes rectifying on the areas that were not in good shape, like the poster’s layout, we had to maintain sufficient white space, kept column alignments logical, and provided clear cues to the readers on how they should “travel” through the poster elements. The strategy was “valuable for portrait-style poster where the bottom part of the paper almost touched the floor” (Purrington, C.B). After a couple of days I had cleared the advert material needed for the event and sent a copy to my supervisor for approval. In life different individuals will have different views on how best to present certain information so I left Evelyn Katingi, CGMap coordinator to play her part. Days after the event we received an email accepting our poster to be presented in a Knowledge Share Fair; this is another great opportunity for us to think of designing a better one thanks to my supervisor. Purrington, C.B. Designing conference posters. Retrieved 5th December, 2011, from http://colinpurrington.com/tips/academic/posterdesign. This contribution is by Simone Staiger-Rivas, Knowledge Sharing Specialist at CIAT, who is serving as a coordinator, facilitator and technology steward for aspects of the ongoing Global Conference on Agricultural Research for Development (GCARD) and e-consultations on reform of the CGIAR. in developing and cultivating the indispensable networks and connections that allow us to involve a representative range of stakeholders actively in the reform process. This is further exacerbated by deeply institutionalized perceptions, norms and behaviors in regard to other actors of change. One consequence of these is the lack of trust among actors, which then leads to confidential side conversations that undermine the efforts for inclusive and transparent consultations around a reform. holding e-consultations does not guarantee that the desired range of actors, sectors and regional views are represented. And even if broad representation is achieved, distrust among participants and absence of face-to-face interactions can make it difficult to reach consensus in virtual environments. In the August issue of the Collective Action News, we revisit food price trends across eastern and southern Africa, a topic we focused on in our first issue, in July 2008, just after the global food price crisis had peaked. We also draw attention to policy responses to the food price crisis, and provide an outlook for food prices in ESA for the rest of 2009. Although the Global Food Price Index (FPI) of the Food and Agriculture Organization (FAO) fell between June 2008 and February 2009, global food prices have been rising slightly since then. Changes in the Global FPI were matched by a persistent increase in FPIs in countries belonging to the Common Market for Eastern and Southern Africa (COMESA), except for Malawi and Comoros, which have experienced very volatile FPIs. On average, the prices of white maize, beans, milk, and non-tradable food items such as bananas, potatoes and yams all increased between January 2007 and January 2009. The visit of Carlos Seré, Director General of the International Livestock Research Institute (ILRI), to IITA Headquarters in Ibadan on Tuesday reaffirmed ties between the two research organizations and signalled potential for broader joint work. Speaking before IITA and ILRI scientists and management during a luncheon meeting at the International House, Seré elaborated on some of the areas that the two organizations could explore. “It has been clear for quite some time that there is a lot of potential for crops to be used in the livestock sector, which is growing quite fast globally. So there is increasing opportunity to add value and create new markets for crops and their by-products, for example in improving animal nutrition. This is just one area among many that ILRI and IITA could work together on in the near future,” he said. 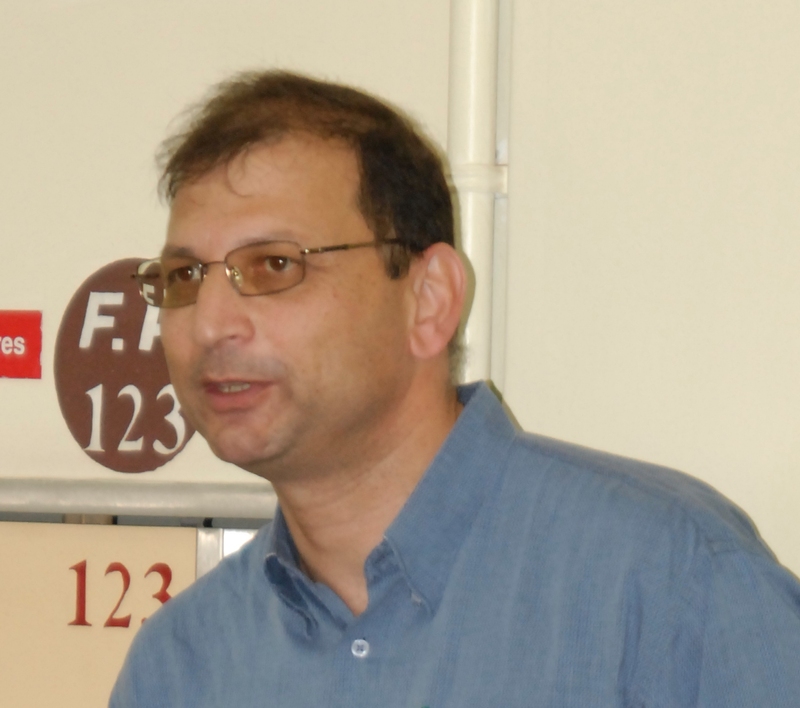 “Additionally, I think the current challenge, research-wise, for both IITA and ILRI is how to optimally and efficiently produce and use biomass,” he added. Seré also mentioned developing value chain for cassava by-products as another possible area of partnership. According to Seré, IITA and ILRI have had a long, strong and productive history of working together, even sharing resources and staff. “But it [partnership] could always be improved, and that is what we intend to do,” he emphasized. “We will re-invest in this partnership,” she added. Seré met with IITA DG Hartmann and Bramel after the luncheon meeting to further discuss and plan ways to move this renewed partnership forward and concretize areas of collaboration. I have learnt that goodbyes are not only tough for the people leaving but also for the ones being left behind. After a great 15 years, today August 10th marks the last day for Ravi Prabhu in the CGIAR who has been Coordinator of the CGIAR Collective Action in Eastern and Southern Africa the past two and a half years. It was interesting to see Ravi blush at his farewell and no, not because of the heat as it was a very chilly day but because of all the pleasant words that people said about him! Some of which include; kind, good sense of humour, eloquent, visionary, committed to what he does, a big dreamer and one who never fears to break the rules (own confession). Having worked with Ravi for close to two years now, I must acknowledge that I will miss a great boss and a mentor, more specifically his wit, counsel, support, critical thinking, among others. Not only did he know what to say and how to say it but most importantly when to say it. He had a word for each season making him an all season communicator. He had a way of making me (and I believe those working with him) feel appreciated, gave credit where it deserved and acknowledged everyone who made contribution and was never short of correction when need be. I believe that he has done more than that. Being the good manager that he is, he made us co-own the vision and I am convinced that the team which he built is keen on realizing the CGIAR’s mission in the eastern and southern Africa region through better alignment of research activities, more effective collaboration and dynamic integration of research programs. If there is anything that I have learnt from working with Ravi is that the way of doing business is adapting to change and with that I believe that our paths will cross again, aren’t we all working for betterment of agriculture and related disciplines anyway! I thank Ravi for his contribution to the CGIAR and wish him all the very best in his new assignment.